New Brunswick Music Scene Archive – What Exit? We’re thrilled to have appeared on NJTV News on Friday, February 12th. View the segment or read the transcript here. The piece features some recent additions to the New Brunswick Music Scene Archive (NBMSA) and a bit of documentary footage of the Court Tavern by friend of the NBMSA Fritch Clark. The segment was filmed here in Special Collections and University Archives’ preservation lab and processing room–where the magic happens. Rutgers’ Special Collections and University Archives and the School of Communication and Information Doctoral Student Association will host a symposium to celebrate the establishment of the New Brunswick Music Scene Archive on Thursday, October 22. 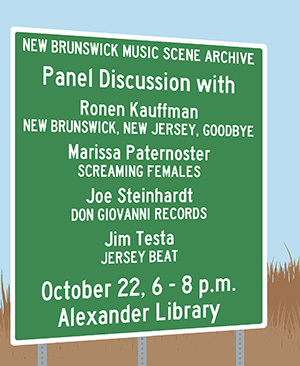 The event will feature a panel discussion with figures from the New Brunswick music scene, past and present: Ronen Kauffman, author of New Brunswick, New Jersey, Goodbye; Marissa Paternoster of the band Screaming Females; Joe Steinhardt, founder of Don Giovanni Records; and Jim Testa, founder and publisher of the influential music magazine Jersey Beat. While the early days of music, performers, and musical venues in New Brunswick have been well documented through manuscripts, sheet music, photographs, programs, and advertisements, there is a gap in the historical record since 1980. Nevertheless the music scene has produced countless pieces of ephemera such as show flyers, zines, photographs, and releases in the form of cassettes, CDs and vinyl records, and digital media. The New Brunswick Music Scene Archive was established to close this gap and to demonstrate the value and reach of independent, local music. The collection will also further Special Collections and University Archives’ mission to collect, preserve, and provide access to materials that document the history and culture of New Jersey. Musical life in New Brunswick can be traced as far back as the early 1800s. Throughout the 19th century, the Hub City boasted numerous theaters, an opera house, music shops, local and traveling musicians, musical associations such as the New Brunswick Band, and the largest musical string manufacturer in the world, the National Musical String Company. The symposium will be held from 6-8 p.m. in the Telecommunications Lecture Hall on the 4th floor of Alexander Library. It is free and open to the public, and light refreshments will be served. Parking is available in the College Ave Parking Deck and Lots 26 and 30. For information on the New Brunswick Music Scene Archive and how to donate material, please email Christie Lutz or call 848-932-6148.